Certainly enough for 3-4 people and so delicious, my only warning is beware of the chicken bones the way they are cut can be sharp and I was eating so ravenously I nearly punctured the top of my mouth as I greedily sucked the meat off of a piece of chicken. Apparently this is also a favorite place of super star chef Danny Bowien who after many visits has adapted this dish for his hipster food mecca Mission Chinese. I ate there for lunch on Sunday but didn’t see it on the menu so maybe it’s an evening thing or served as a special? In any case I’m sure it’s cheaper at Spicy Village even thought the atmosphere isn’t as nice. Or you can make your own here’s Danny and Martha going at it. 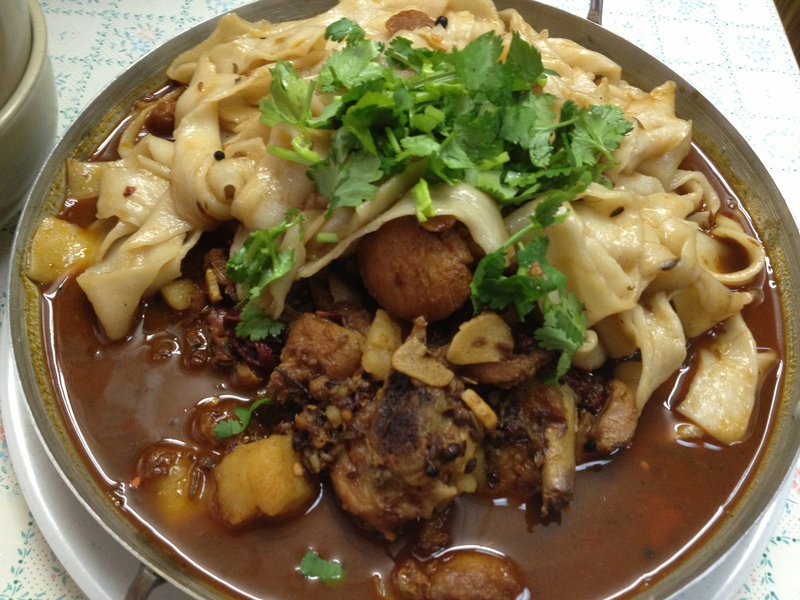 This entry was posted in NYC, Recipes and tagged beer braised henan chicken, biang biang noodles, big tray of chicken, danny bowien, martha stewart, Mission Chinese, spicy village, wall street journal. Bookmark the permalink. That looks so good — I am a complete sucker for home made noodles. (which might mean that I ought to take the trouble to make some) I am going to tell my mother to go to Spicy Village immediately and have a big helping of this! I just edited this to add a recipe and video for how to make your own noodles! And yes send her – well worth the journey and if she wants a little diversity the soup dumplings are really good too!